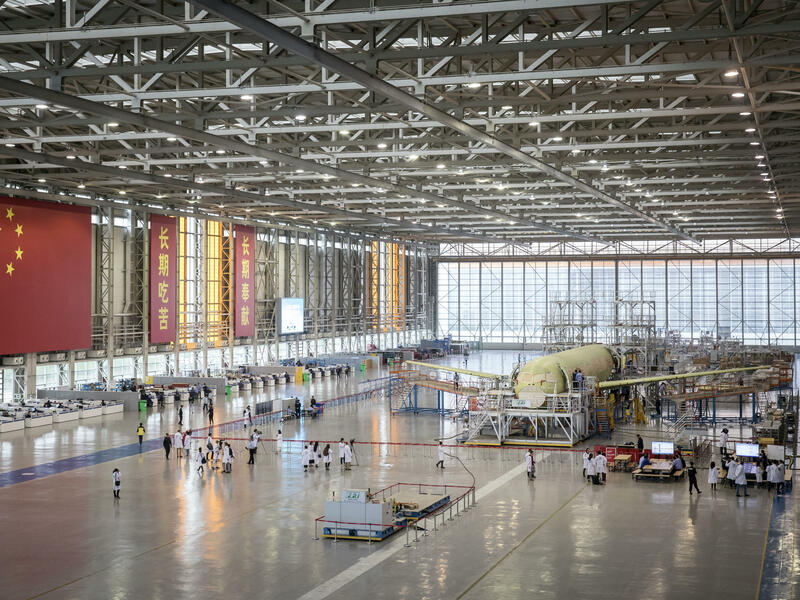 A Commercial Aircraft Corp. of China Ltd. C919 aircraft stands under assembly in Shanghai in 2017. Proposed U.S. tariffs take special aim at the "Made in China 2025" plan, which supports development of advanced technologies in fields such as artificial intelligence, robotics, biopharmaceuticals, new energy vehicles and aviation. Chinese President Xi Jinping promised in a speech on April 10 to cut auto import taxes, open China's markets further and improve conditions for foreign companies. 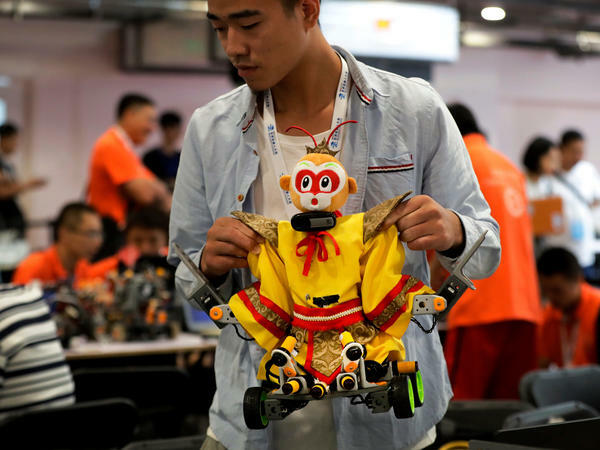 A college student carries his robot depicting the Chinese mythical Monkey King for a competition at the World Robot Conference last August in Beijing. Last Tuesday, Chinese President Xi Jinping pledged to open markets, protect intellectual property and increase imports. The following day, China's central bank governor pledged to open the country's financial sector to foreign investment. But China insisted this had nothing to do with ongoing trade frictions with the U.S. There was no immediate reaction from Washington, other than a presidential tweet in which Donald Trump thanked Xi for his pledges. China's commerce ministry, meanwhile, denied that Xi's remarks represented concessions to the U.S. — or that any are warranted. China has been particularly unapologetic about its strategic industrial policy, dubbed "Made in China 2025." Proposed U.S. tariffs take special aim at this policy, which a recent report by the U.S. Trade Representative describes as discriminatory toward U.S. firms and a threat to U.S. trade. The Made in China plan, announced in 2015, calls for China's government to funnel billions of dollars into developing and acquiring advanced technologies in fields such as artificial intelligence, robotics, biopharmaceuticals, new energy vehicles and aviation. The Trump administration sees the policy as another effort to steal U.S. technology and push American firms out of the Chinese market. But, says Douglas Fuller, an expert on China's technology policies at Zhejiang University in Hangzhou, "You can't just tell China that, 'No, you're not allowed to continue your technological development.'" Dong Yang, the vice chairman of the China Association of Automobile Manufacturers, and other Chinese business leaders see upgrading industry as a natural part of any country's economic development. The tariffs look to them like just another U.S. effort to thwart China's rise. "Why should one country take aim at another country's policy to develop its own economy?" Dong says. "Just mind your own business." The Made in China plan also calls for Chinese companies to control 70 percent of the domestic market in key sectors by the year 2025. The idea is to help China transition from making labor-intensive, low-profit goods such as toys, apparel and furniture, into more lucrative, capital- and technology-intensive products. "We will promote China's industries' progress toward the middle and upper reaches of the global value chain, and foster groups of world-class, advanced manufacturers," Xi told delegates to the 19th National Congress of the ruling Communist Party last November. Beijing Institute of Technology economist Hu Xingdou says the policy might help some Chinese firms. "Or it might create huge production overcapacity and waste," he warns. "It may also tempt many companies to try to trick the government into giving them subsidies." Hu cites state media reports (some of which were later refuted by other state media) that most research and development funding in China never makes it to the intended projects, and is instead often wasted on unnecessary meetings and travel. The problem, Hu says, is that China lacks a modern R&D system with effective systems of evaluation and oversight. Another concern is that government subsidies lure so many firms into certain industries that it creates a glut of products, which China then dumps on international markets and crashes prices, as has been the case with steel and solar panels. "To the extent that [Made in China 2025] is coercive, to the extent that it is inconsistent in dramatic ways with market-based principles of competition, it fundamentally distorts the world economy," argues Lester Ross, partner-in-charge of the U.S. law firm WilmerHale's Beijing office. China's vice trade minister Wang Shouwen rejected U.S. criticisms at a recent press conference. "Made in China 2025 is transparent, open and non-discriminatory," he said. "Foreign and Chinese companies, public and private-sector companies can all participate." Wang added that his ministry has reviewed the Made in China plan to ensure its strict compliance with World Trade Organization rules. And, he said, China has no intention to monopolize domestic markets. "Some of the targets in our plan are intended as forecasts or guidance," he insisted. "They're not mandatory requirements." Fuller says that U.S. tariffs aimed at Made in China 2025 are not likely to be very effective, partly because China exports very few hi-tech products to the U.S. Most Chinese tech firms, such as electric car makers, are not yet mature enough to compete in U.S. markets. Others, like telecom giant Huawei, are already effectively barred by the U.S. government on national security grounds. For now, says Fuller, the focus of Made in China 2025 "is really quite domestic, and that's going to create a lot of business opportunities for these firms in China." When it comes to the trade spat with the U.S., he says, "I don't see anyone here really quaking in their boots." Instead, Fuller suggests that the U.S. would do better to come up with its own industrial policy and put more money into cutting-edge scientific research. "The U.S. really has to look at itself," he says, "and decide where its priorities are to stay competitive." You're listening to ALL THINGS CONSIDERED from NPR News. The trade fight between the U.S. and China took another turn this week. China announced new tariffs on U.S. grain yesterday and gave in to U.S. demands on car imports. NPR's Anthony Kuhn reports the Chinese are fending off accusations of stealing American technology while trying to advance their own. 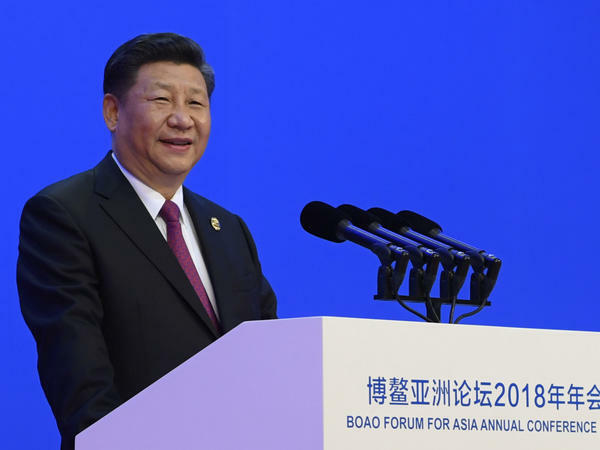 ANTHONY KUHN, BYLINE: In a speech to an economic forum last week, President Xi Jinping celebrated 40 years of market-oriented reforms and opening to the outside world. He said the policies had helped China to become the world's largest manufacturing and trading nation. And he peppered his speech with pithy classical Chinese sayings. KUHN: "The way of heaven rewards those who are industrious," he intoned, "and that which flowers in spring will bear fruit in fall." The implication is that China got where it is today through smart policies and hard work, not, as the U.S. alleges, by stealing advanced American technology. Xi Jinping pledged that China would open its markets even wider, for example, by lowering its 25 percent tariff on imported cars. Yesterday, China said that over the next five years, it'll remove the requirement that foreign automakers have to establish joint ventures with local firms to make cars in China. Dong Yang is Vice Chairman of the China Association of Automobile Manufacturers. He says lower tariffs could eat into Chinese carmakers' profits, but it shouldn't scare them. DONG YANG: (Through interpreter) China is already the largest market for cars. It has the largest scale production, and it has a good deal of R&D, so I think we can hang on. KUHN: The proposed U.S. tariffs take special aim at Made in China 2025, a government policy aimed at upgrading China's industries and dominating domestic markets for things like artificial intelligence, pharmaceuticals and new energy vehicles. The Trump administration sees the policy as another effort to steal U.S. technology and push American firms out of the Chinese market. Dong Yang dismisses such criticism. DONG: (Through interpreter) Why should one country take aim at another country's policy to develop its own economy? Just mind your own business. KUHN: Dong and other Chinese see upgrading industry as a natural part of any country's economic development. And the tariffs look to them like just another U.S. effort to thwart China's rise. DOUGLAS FULLER: It actually - in some sense, this puts the U.S. in kind of a bad light. KUHN: That's Douglas Fuller, an expert on China's technology policy at Zhejiang University in East China's Hangzhou city. FULLER: Because you can't just tell China that, no, you're not allowed to continue your technological development. KUHN: Fuller is skeptical that Made in China 2025 will succeed and that China's government can just create technical innovation by spending mountains of money. And while he says the U.S. may have legitimate concerns about the policy, tariffs will do little to stop Made in China. FULLER: The focus of that really is quite domestic, and that's going to create a lot of business opportunities for these firms in China. So I don't see anyone here really quaking in their boots over what has happened thus far in the trade spat. KUHN: Fuller points out that China does not export many high-tech goods to the U.S. Chinese electric carmakers, for example, are not yet ready to compete in the U.S. market. Others, like telecoms giant Huawei, are already barred by Washington on national security grounds. Instead, Fuller suggests that the U.S. would do better to put more money into scientific research. FULLER: The U.S. really has to look at itself and decide where its priorities are to stay competitive. KUHN: China lags behind the U.S. technologically, he says. But if current trends continue, the U.S. may squander its lead. Anthony Kuhn, NPR News, Beijing. Transcript provided by NPR, Copyright NPR.